Schwab Intelligent Portfolios: The Evolution of the Robo Advisor? You are here: Home / Financial Advisors / Schwab Intelligent Portfolios: The Evolution of the Robo Advisor? Charles Schwab (SCHW) recently launched its much anticipate entry into the Robo Advisor space, Schwab Intelligent Portfolios. Schwab instantly will become a major player here simply because they are Schwab. I honest don’t know if Intelligent Portfolios are a good thing for investors or not. I do suspect that the introduction of Schwab Intelligent Portfolios represents a big step in the evolution of Robo Advisors. Betterment CEO Jonathan Stein appeared on CNBC recently and frankly I was taken aback at how critical he was of the new Schwab offering. Wealthfront’s CEO wrote a very critical post about Schwab’s entrance into the Robo Advisor space. These reactions alone tell me that Schwab’s Intelligent Portfolios are a big deal and a potential game changer in the Robo Advisor world. Wealthfront and Betterment are two of the stronger players in the Robo Advisor space. Both are well-funded and Betterment has forged a deal with Fidelity to allow them to offer Betterment to the advisors who custody assets with Fidelity Institutional. The reactions of these executives tell me they are more than a bit concerned about Schwab entering their space. Competitor reactions mean that Schwab’s Intelligent Portfolios are a big deal. Schwab Intelligent Portfolios have a low $5,000 minimum investment, they carry no management fees, investors will not incur any direct transaction costs and there are no account fees. Like most Robo Advisors, Intelligent Portfolios will be powered by algorithms using ETFs across 20 different asset classes, as well as a cash allocation invested in a bank account at a Schwab-affiliated bank. The Schwab Intelligent Portfolios are bit different than other Robo Advisor models in that they will allocate a significant percentage of an investor’s portfolio to several Schwab ETFs based on the fundamental indexing approach of advisor Rob Arnott. The service will utilize model portfolios for investors based upon their goals and risk tolerance. Additionally each of the portfolios has a significant allocation to cash via Schwab’s affiliated bank. The allocation would range from 7% for a 30-year-old investor to 15% for a more conservative 65 year-old investor. The cash allocations have initially drawn a skeptical reaction from some financial advisors. While there will be no fees for the service, Schwab will make money from the expense ratios of the ETFs, as well as the money invested via the Schwab affiliated bank. The Intelligent Portfolios will include tax-loss harvesting for investors with at least $50,000 invested as well as automatic rebalancing. Additionally Schwab has announced the launch of an institutional version of the Intelligent Portfolios during the second quarter of 2015 for use by financial advisors who custody assets with Schwab Institutional. Schwab’s Intelligent Portfolios represents the latest entry into the Robo Advisor space by a major financial services firms. Fidelity Investments has formed partnerships with Betterment and Learnvest that allows financial advisors who custody assets with them to offer these services to their clients under their own umbrella. This is a great way for these advisors to court younger clients who might not meet their normal minimums and work with them in a meaningful way until they might become full-service clients in the future. Vanguard has launched its own Robo Advisor service and it has drawn over $4.5 billion in assets without any advertising. Most of this money has likely come from investors with money already at Vanguard and represents an additional 20 to 40 basis points in revenue on money that is already there. For the very reasonable fee Vanguard offers clients a financial plan, asset allocation advice, rebalancing and ongoing financial advice. They likely will roll this service out more widely in the near future and they reportedly are thinking of offering a version for financial advisors whom their institutional sales group already calls on. Overall the Robo Advisor offerings by Schwab, Fidelity, Vanguard, TD Ameritrade and some others represent the next step in the evolution of Robo Advisors. At some point I envision the use of Robo Advisors by the likes of Schwab and the financial advisors who custody with them almost like Major League Baseball uses the minor leagues as a farm system. Clients who want solid advice but who don’t meet the minimums of many financial advisors will start out in some sort of online service and as their accounts grow and their needs evolve they will move to the “big leagues” and become full service clients. Overall I view the evolution of the Robo Advisor as a good thing for both clients and financial advisors. 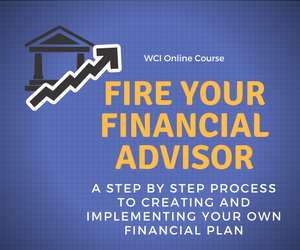 For clients this represents another choice in how to get financial advice. For financial advisors it represents a viable way to serve clients who the financial services industry has not done a good job of serving in the past. We Interrupt This Program To Bring You… RoboWars a great piece on I heart Wall Street. Broken Values & Bottom Lines the piece I mentioned above by Wealthfront CEO Adam Nash. I asked three robots how I should invest, got three different answers by Yahoo! Finance’s Michael Santolli. Robo-Advisors and a Human Touch: Better Together? I invite you to contact me to ask any questions that you might have, to tell me what you like or don’t like about the site, and to suggest topics that you would like to see covered here in the future. Please check out our Resources page for tools and services that you might find useful. Are IRA Promotions a Good Reason to Invest? Hi Roger: One suggested correction. You say: “Schwab Intelligent Portfolios have a low $5,000 minimum investment, they carry no management fees, investors will not incur any direct transaction costs and there are no account fees.” Actually Schwab’s website says it does not charge advisory fees like other Robos or financial advisors. But, its ETFs do charge management fees. A subtle, but important distinction. This is how Schwab advertises a free service, but still makes money. It is betting investors do not know the difference between advisory services and money management services. And you are right, Schwab + Free is a powerful combination if investors don’t mind being manipulated. Jack thanks for your comment. Your comment is correct, I did go on to say later on in the piece that Schwab does make money from the ETFs but I probably could have made this more clear, thank for pointing this out. This piece was not meant to be a value judgment regarding the merits of Intelligent Portfolios but rather on the business aspect where I think Schwab will do well and I also think this (and the introduction of their institutional version for advisors) represents the next evolution of the Robo Advisor world. Yes I agree with Jack Waymire. Great Article. blog post – I learned a lot from the insight , Does someone know where my company might be able to locate a blank Hyatt Credit Card Authorization Form example to use ? Pension Payments – Annuity or Lump-Sum?